I’m almost to the bind off on my toe up socks, which I knit with Schoppel Wolle Flying Saucer sock yarn. 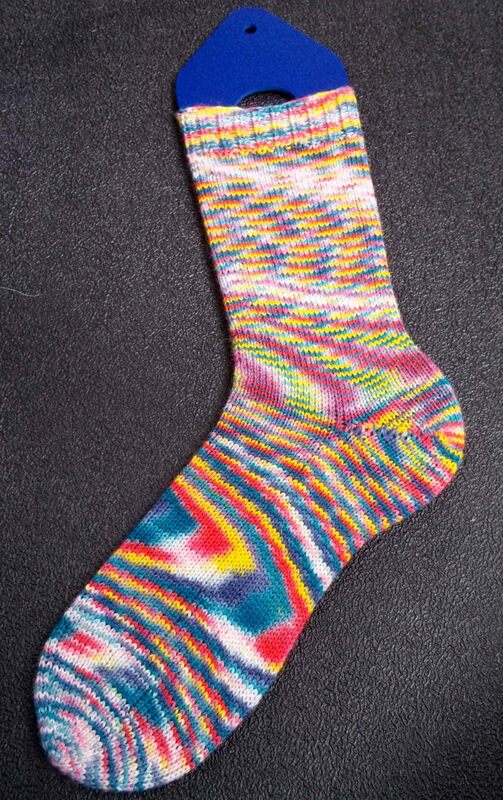 And, for reasons unknown to me, the yarn didn’t do its cool tie dye bit on the leg of the sock, only on the foot. And I am sad that the coolest part of the sock will be hidden away in a shoe. I finished the sock, so I thought I'd show you what I was talking about. All is not lost, however, as I had a brilliant brainstorm. Wait for it. Clear shoes! I think this is a highly marketable item for the yarn loving community. We knitters love our socks. We’re proud of our socks. And we want to show them off. What better way than with clear shoes? There could be different styles; clear loafers for every day work socks, clear ballerina slippers for delicate lace socks, clear ked-type for coordinating laces with socks, and clear boots for cable socks. And I will be first in line with my Schoppel Wolle Flying Saucer socks. Indeed, I have seen clear shoes. Most recent kind were jellies. But have you thought of cutting the thread and starting at a different point in order to change how the color pools? Might not be practical… but if you are using wool you can splice the yarn fairly easily. I imagine the pattern you found answered your question, but thought I would add that I worked with 62 sts on 2.5 mm needles. Thanks! It’s taken a while, but I think I’m finally getting this right. The whole winding/re-winding is a lot of effort, but the results are so cool. I actually want to try more colors. Maybe you should put a leather sole on yours so you can just wear the socks without any shoes. Happy knitting! By the way, I LOVE your sock! You should be happy! It looks like you have to use this yarn top down. Just found this! Maybe this will help on the next pair! That is helpful, thanks for sharing! It’s too late for me, but perhaps it can help you and other knitters out there working with this yarn. Very creative idea, clear shoes. Unfortunately, those who wear ugly manufactured socks won’t have anything to show off.